Lewis Hamilton has become the most arrogant person inside the F1 paddock. He did not sign photographs at all, especially large ones. He ignored them at any time. He only did sign a few programmes, papers and other fan stuff. There was no chance to get an photograph signed at all. Since 1994 I visited nearly 100 Grand Prix, test sessions and events concerning to Formula One and motor racing in Europe. 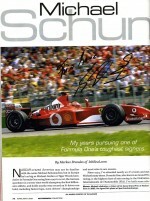 During that long time I was happy to meet Michael Schumacher more often than any other Formula One fan. Now I would like to give you a closer look at Michael, especially I want to show you how thrilling the autograph hunting with him was. There were rich possibilities to collect drivers autograph by the Hungarian Grand Prix last weekend in Budapest. It was quite unusual to see Sebastian Vettel in red colors. But good news: he is still the most friendly driver in the F1 paddock. He had really fun to sign Ferrari pictures, although he does not sign as much as in the past. But still very satisfying. Kimi was like always. He signed one photograph per meeting, but it was really tough to meet and get him. Great. He is the World Champion and also as friendly as your best friend from the next door. Unbelievable friendly. OK, it is not easy to meet him, but then he signs many photographs. and shorter. Also it is completely different than last year.